A bright idea and home town pride prompted this ex-sweater manufacturer to beautify the city’s neglected pavements. Now he reaps the reward. EAST Side, West Side, all around the Town . . . my Sidewalk Sanitation Service has made its debut and though it doesn’t cover quite as big an area as the song does—yet—I hope S.S.S. will be just as familiar before long. 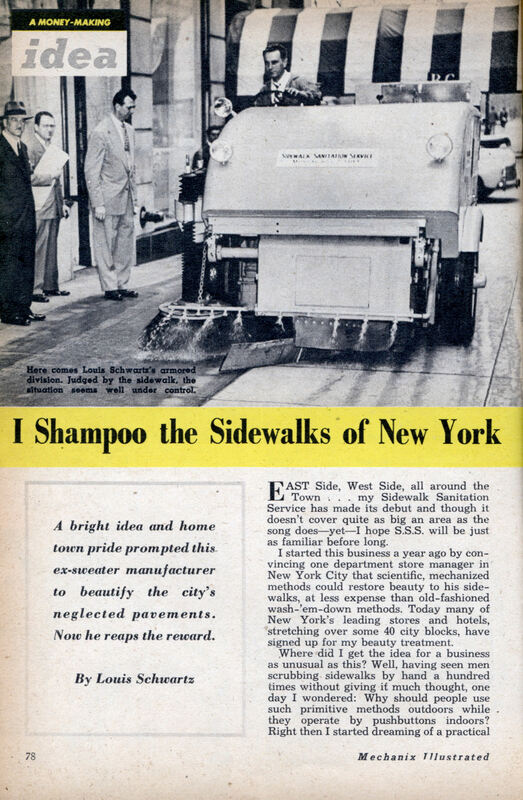 I started this business a year ago by convincing one department store manager in New York City that scientific, mechanized methods could restore beauty to his sidewalks, at less expense than old-fashioned wash-’em-down methods. Today many of New York’s leading stores and hotels, stretching over some 40 city blocks, have signed up for my beauty treatment. Where did I get the idea for a business as unusual as this? Well, having seen men scrubbing sidewalks by hand a hundred times without giving if much thought, one day I wondered: Why should people use such primitive methods outdoors while. they operate by pushbuttons indoors? Right then I started dreaming of a practical method to give stores and hotels better and cheaper cleaning service. Street cleaning is the city’s responsibility but sidewalk shampooing is left up to the property owners. Why couldn’t I relieve them of this responsibility—and make a few dollars doing it? I also wanted to have a hand in beautifying New York, my home town. Then the fun began. Aside from watching my wife clean house, I had no background at all for my proposed occupation. Before the war I was in the ladies’ sweater manufacturing business. Then I became a navigator on a B-24 and served in the South Pacific where the girls don’t wear sweaters. No sidewalk sanitation in the picture yet. But I have always liked to tinker and I went to work on my new idea wholeheartedly, experimenting and doing research, checking with city authorities and consulting manufacturers. I concocted several cleaning compounds and tried some of them out on the Fifth Avenue sidewalk in front of Bergdorf Goodman, one of New York’s ritziest stores. There are many different types of cement pavement. I wanted to discover the compound best adapted to all types. Every night for a couple of weeks I stationed myself in front of Bergdorf Goodman, poured on the detergent, then scrubbed away with a brush. After scouring for a while and noting the effect on the pavement, I’d go home. But that was much later. First I spent considerable time helping to design our special scrubbing machines. Then I had to get permission from the city to use the machines on the pavements while working out the most efficient cleaning techniques. All told, it cost about $15,000 to get started. As we finally worked it out, through trial and error, there are three separate steps to our cleaning technique. The first operation consists of general debris removal. You’d be surprised, as I was at first, to see how much dirt accumulates on those famous sidewalks of New York. The worst offender is chewing gum. But we evolved a high-pressure steam machine which, together with my compound, goes to work on the pores of the cement and does a first-rate cleaning job. This machine also restores the original color of the sidewalk. After this initial conditioning, our big baby goes to work. I’m very proud of our two three-wheeled monsters which resemble tanks as they lumber up and down the sidewalks. 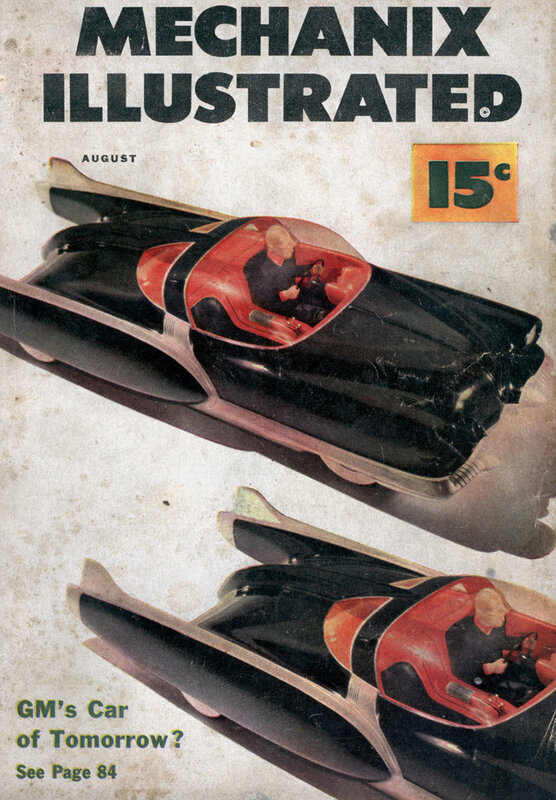 Actually, they’re patterned after the city’s own street cleaning machines, adapted to our own special use. Each holds a 150-gallon water tank which, since the water shortage began in New York, I fill with chlorinated river water mixed with my chemical detergent. Nozzles strung across the 5-1/2-ft.-wide bottom of our tanks spray the treated water on the sidewalk. This mixture attacks the dirt in the cement and a big brush attached in front of the rear wheel sweeps and scrubs. The operation is very effective. It also pleases the city officials, as well as our customers, since all litter is actually picked up—sucked into a hopper—and not just tossed aside for someone else to pick up. Some of the stores take this service five nights a week and the hotels usually subscribe to it seven days a week. On the busy sidewalks of the world’s largest city, our little “tank” arouses great curiosity. When we first tried it out about a year ago, it was quite a traffic stopper. One woman onlooker recently told one of my men that she was tremendously impressed with what he was doing and that she would personally go and speak to the mayor and ask him to duplicate our service on all the streets of New York. Who knows, maybe she did! Anyway, I do know that good will always pays off. I also worked out a little patrol machine which constitutes the third phase in our service. We have ten of these machines now. They resemble carpet sweepers and my men use them during the day to pick up cigarette stubs, fine dust and any other debris that doesn’t belong on a sidewalk. Stores take this service at least three times during the day, hotels more often. In winter, S.S.S. is also in the snow removal business. We are the only private snow removal company in the city, equipped to give service on a large scale. We’re on call day and night, Sundays and holidays, with gasoline-driven snowplows. The Weather Bureau notifies us when a storm is brewing and we have on file the names of some 500 college students who are willing to pitch in as soon as the flakes begin to whirl. Our quest for cleaner sidewalks doesn’t confine itself to New York. We are in the $100,000 business bracket and are negotiating with men in other cities who will join Sidewalk Sanitation Service on a franchise basis. These men, whom I screen very carefully, buy all the necessary equipment through me. For approximately $20,000 they get the machines and complete instructions. I make the contacts for these men, getting in touch with civic groups as well as merchants, because we must have the complete cooperation of everyone concerned. A franchise operator’s income depends on how much ingenuity he puts into the work. He should earn somewhere between $5,000 and $10,000 the first year. “I shampoo the sidewalks of newyork”… And I give deep tissue massages and acupuncture to the skyscrapers of los angeles.